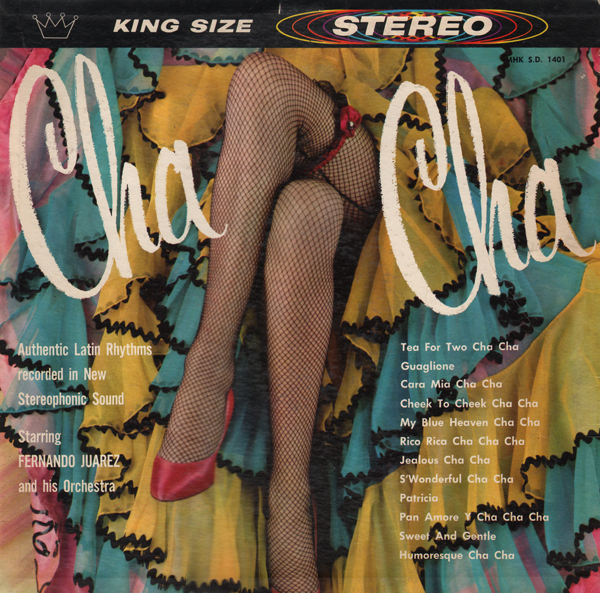 Surprisingly good space age Cha Cha from budget label Waldorf. Lloyd's group, for this set: Lloyd Trottman - bass, Panama Francis and Soloman Hall - Drums. This is a tight and mellow small combo set, but the arrangements do not reflect the hip or conceptual vibe of the cover art. From the back cover: It must be the despair of every experienced musician who has worked long and hard polishing and developing his talent to come upon someone like Ceil Lloyd. 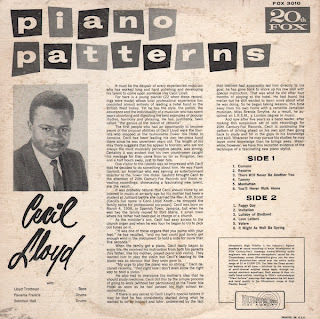 For here is a young pianist (22 when these recordings were made) whose total professional experience has consisted almost entirely of leading a hotel band in the British West Indies. Yet he has the style, the polish, the assurance and the individuality of a musician who has spent years absorbing and digesting the best examples of popular rhythm, harmony and phrasing. He has justifiably, been called "the genius of the island of Jamaica. The first people who had an opportunity to become aware of the unusual abilities of Ceil Lloyd were the tourist who stopped at the fashionable Tower Isle Hotel in Jamaica. Ceil has been leading his own ten-piece band there since he was seventeen years old. The length of his stay there suggests that his appeal to tourists, who are not always the most musically perceptive people, was strong, Certainly it was evident that his own countrymen caught his message for they came from as far as Kingston, two and a half hours away, just to hear him. One visitor to the island was so impressed with Ceil that he decided to do something about him. He was Frank Gaylord, an American who was serving as entertainment director at the Tower Isle Hotel. 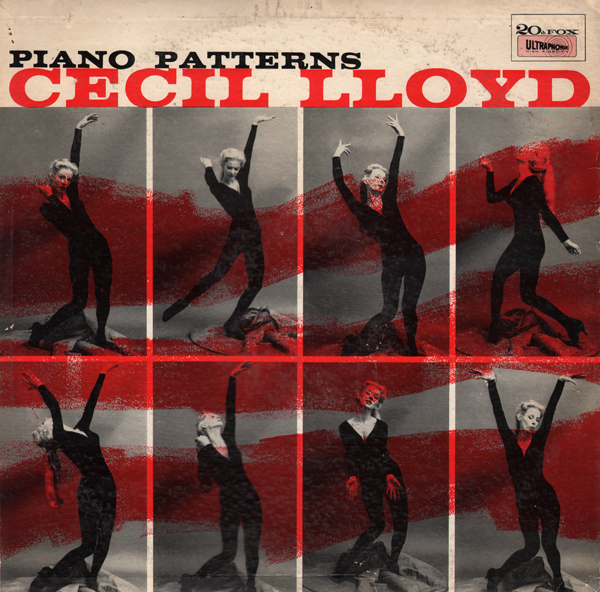 Gaylord brought Ceil to the attention of 20th Century-Fox Records and these revealing recordings, showcasing a fascinating new talent, are the result. It was probably natural that Ceil should come by an interest in music at an early age for his mother had been a student at Juilliard before she married the Rev. A. W. Knott (Ceil's full name is Cecil Lloyd Knott – he dropped the family name for professional purposes). Ceil was born on March 4, 1936, in Spanish Town, Jamaica, but when he was two the family moved to Port Maria, a small town where his father had been put in charge of a church. As a minister's son, Ceil has easy access to the church organ and when he was four he began to try and pick out tunes on it. "It was one of those organs that you pump with your feet," he recalled, "and my feet could just barely get enough wind in the instrument to hold a note for more than five seconds." When the family got a piano, Cecil really began to enjoy life. He received his instruction from both his parents (his father, like his mother, played piano and violin). They wanted him to play the violin but Ceil's leaning to the piano was so obvious that they soon gave in. "My urge to play the piano was so strong," Cecil declared recently, "that right now I don't even know the right way to hold a violin." He also had to overcome his mother's ideas that he should study medicine. Cecil did this by the simple process of going to work (without her permission) at the Tower Isle Hotel as soon as he had passed his high school examinations. 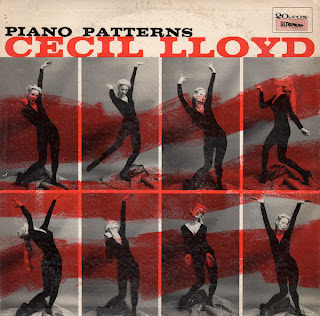 If there is any secret to Cecil Lloyd's special talents it may be that he has consistently started doing what he wanted to do to by instinct and later, undeterred by the fat that instinct had apparently led him directly to his goal, he has gone back to shore up his raw skill with special instruction. That was what he did after four months of playing at the hotel. He had found his metier but he still wanted to learn more about what he was doing. So he began taking lessons, this time away from his own home with a versatile Jamaican musician, Miss Brenda Smythe. As a result, he acquired an L.R.S.M., a London degree in music. 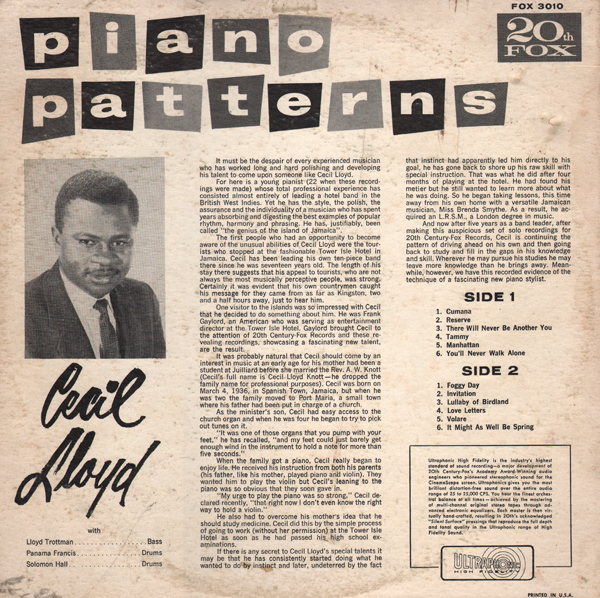 And now after five years as band leader, after making this auspicious set of solo recordings for 20th Century Fox Records, Cecil is continuing the pattern of driving ahead on his own and then going back to study and fill in the gaps in his knowledge and skill. Wherever he may pursue his studies he may leave more knowledge than he brings away. Meanwhile, however, we have this recorded evidence of the technique of a fascinating new piano stylist. This is, perhaps, not the most engaging cover image World Pacific might have created to market this project. The audio content is sophisticated "movie theme" jazzy space age fair that deserved an image to match the cool factor of the sound. From the back cover: For this musical movie, Bud Shank has surrounded himself with musicians who are also no strangers to the studios' sound recording stages. They are also no strangers to recording sessions with Bud, for they have starred in many of his pervious record productions. 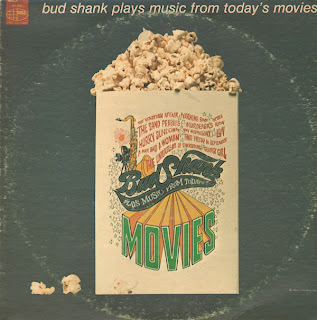 For this album, Shank has limited himself to playing alto-sax: Bob Florence, who arranged and conducted the earlier "Michelle" and "California Dream" albums returns for similar duty here, plus fancy pianistics. Other members are: Victor Feldman on vibraphone and percussion. Mike Melvoin on organ and harpsichord (electric and otherwise), Frank Capp, drums, Dennis Budimir and Herb Ellis on guitars, Ray Brown on bass and Jimmy Zito on flugelhorn. These tracks may be found online as part of the GNP catalog. So I won't be posting a sample. From the back cover: Rene Touzet was born in Havana and was a child prodigy. He studied with the outstanding music teachers; won first prize in piano at the Falcon Conservatory; and in 1953, the Gold Medal as Cuba's outstanding composer. 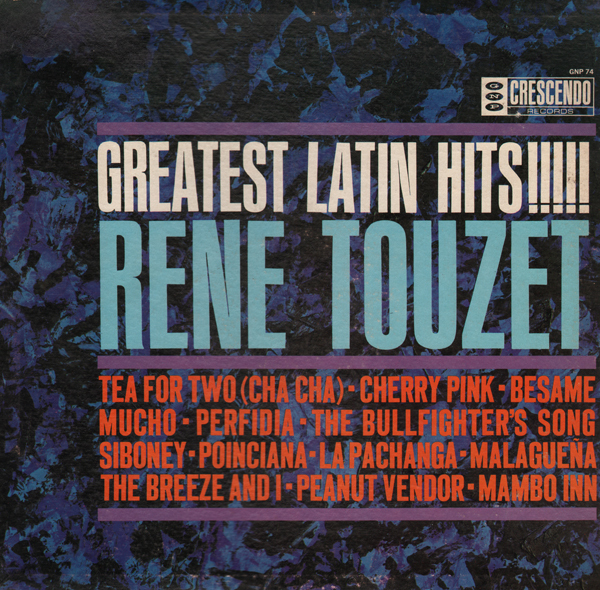 Touzet first led his own 16 piece band at the Hotel National in Havana. In 1946, he came to the States to join Enric Madriguera. Shortly thereafter, he formed his own ban and has since been featured at the Crescendo and Ciro's in Hollywood and many of the elite supper clubs in New York and Miami. 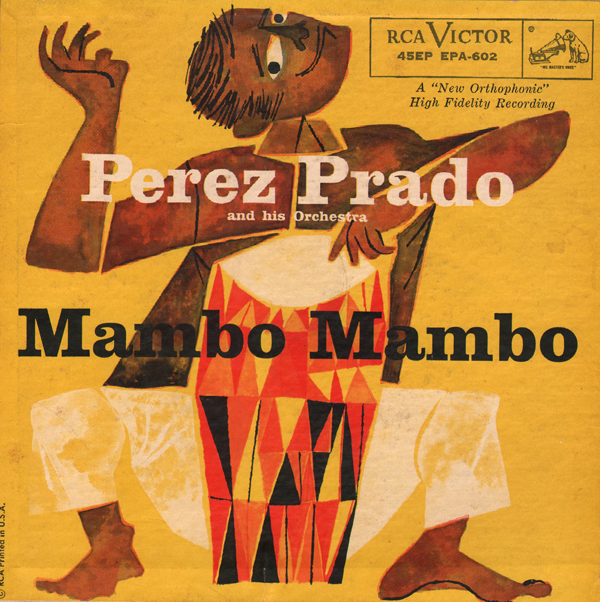 Super jazzy space age Latin! 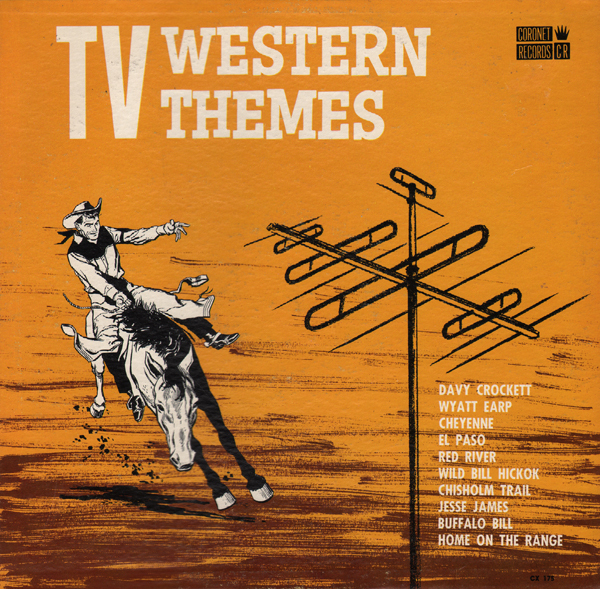 Tracks cobbled together and sold as if the set was recorded by "Slim Boyd and His Ranger Riders". Verve, who pressed some inventive space age material, wasn't sure how to market this first Chaino album suggesting, from the back cover, that "...this music can be utilized as a home session for you own bongo playing." 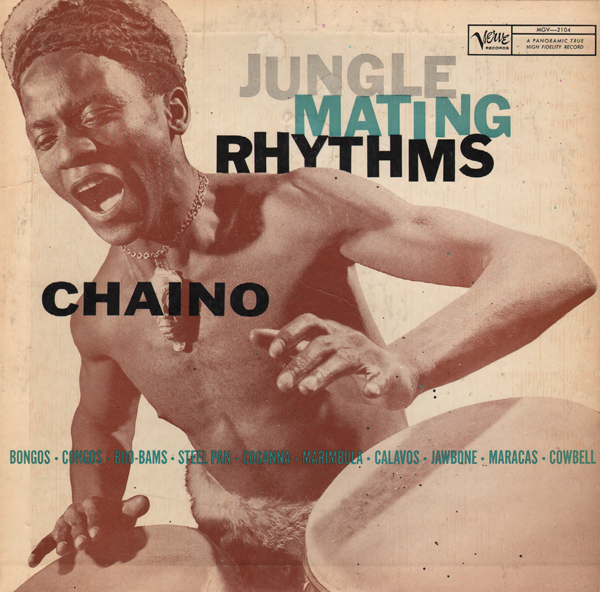 to "...Chaino... has been invited by several psychiatrists to play for disturbed institutionalized patients, and the patients in turn have been encouraged to take up rhythm instruments to further the releasing process." Also from the back cover, perhaps a better descriptive paragraph: As for Chaino himself, it's relevant to add that he is capable here of drawing a wider range of emotions that you'd expect (given, I think, from the simplicity of presentation) from his material. There is a tenderness, a lyricism one might say, in much of his work that can also turn into a fervent Bacchic ball. Basically, this is a one-man show, Chaino and his "drums" produced by Kirby Allen. Chaino and Allen produce a range of engaging percussion arrangements occasionally backed by Chaino vocal chants. Nice late 50s package from the cover art to the creative song titles. Presented here for the cover art. All tracks can be found for purchase online. Nice energetic Prado set.